The Hunger Games. What can you say about it? Well, it was a decent book that spawned a decent movie. It also features the very cute Jennifer Lawrence, which doesn’t hurt. Of course, there’s a sequel, and it’s called Cathing Fire. Of course again, a new trailer for the movie dropped during last night’s MTV Movie Awards. Don’t get us started on how useless the awards are, just enjoy the new trailer. Or, don’t. No pressure. We won’t judge you either way. Lawrence, Liam Hemsworth, and Josh Hutcherson are back for the Francis Lawrence (no relation)-directed November 22 sequel. Check out the teaser after the break. It’s not just because he did a pretty great job with the Stark Trak reboot, we just like J.J. Abrams’ work. In fact, we’re interested when he pretty much does anything. Add that to our love of anything post-apocalyptic and that brings us to the upcoming show Revolution. Sure, it does have a couple things against it, not the least of which is the fact that Bella’s dad from Twilight in one of the leads (although he does a pretty good job) or that the show seems like a bit of a rip off of The Hunger Games (it mostly isn’t). Still, we’ve watched a couple episodes already and it’s actually pretty good. You might like it too. Plus, it’s got Giancarlo Esposito in it and was directed by that guy who did Iron Man (you know him as Jon Favreau), so that goes a long way for us. We’ve got previews for the show, which premieres tonight on NBC. Take a look at them after the break. Let us know what you think of the show. The Avengers and The Dark Knight Rises were not the only box office behemoths in the last year. 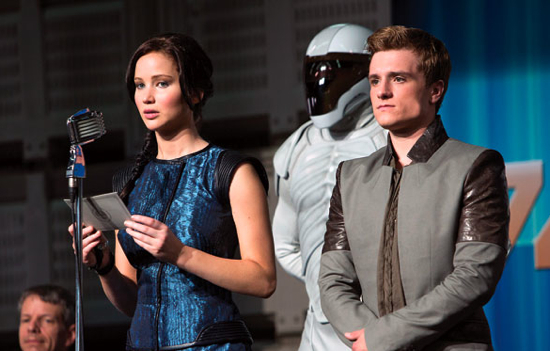 The Hunger Games took the world by storm back in March raking in over $650 Million globally. That’s number that might seem quaint compared to Joss Whedon’s big budget nerd-gasem, but contextually it’s a massive hit on a surprising scale. So all eyes are now on its sequel which is about to begin filming, and one of the major new characters has just be cast. Most people probably do not know the name Sam Claflin, but he has been in a few big budget blockbusters and now is primed to take the next step into wide-spread recognition, by taking on the role of Finnick Odair. Claflin was a bit of an afterthought in Pirates of the Caribbean: On Stranger Tides, but he actually turned in an impressive performance in Snow White and the Huntsman, so much so that some people actually liked his character more than Hemsworth’s Huntsman. Now he has a chance to turn heads in a film that will no doubt be a cultural event when it is released. Hopefully this casting is another in the long line of impressive casting decisions so far in the series, managing to get good actors not just pretty faces like another sparkly franchise that has been popular lately. Keep an eye on The Flickcast for any new Hunger Games news bits as the anticipated sequel heads towards production. In its second weekend in release The Avengers brought in over $100 Million bucks. I will write that again for effect. In its second weekend in release The Avengers brought in over $100 Million bucks! That absurd second weekend haul obliterates the second weekend record just as the debut frame obliterated records last week. For reference the previous best second weekend was Avatar with a bit over $75 million. The movie has already cleared a billion in total Box Office and it has only been in US cinemas for 10 days. So yes, The Avengers continues to draw in the masses and shatter records left and right. At this point in time it seems plausible that the movie will end up as the third most successful film of all time. Why not the top slot if it is doing better than everything else right now? The start of the Summer season is just to hard of a spot for the movie to have the kind of legs required to break that pesky 2 billion dollar plateau. Domestically this was a very weak weekend. The defending champion held its crown among a very unimpressive selection of new challengers. Think Like A Man dropped about 47% to bring in around $18 Million. The back-to-back wins catapulted the film passed Titanic 3D as the highest grossing film released this month. The second place finisher was the most recent stop-motion animated film from the guys over at Aardman Studios. The Pirates! Band of Misfits did typically weak for the British Animation Studio who has yet to have a huge box office win despite a quality of output that ranks right up with PIXAR. The Lucky One sputtered into third place with just over $11 Million, representing a 50% drop over its debut weekend. If the number seems low that’s because it is. The weekend as a whole was incredibly light compared to last year. All of this has the distinct feel of the quiet before the storm as The Avengers comes out next week. After a very impressive run, The Hunger Games has finally fallen from the top spot of the box office. It held well again, dropping only 31% and bringing in an estimated $14.5 Million, but at the end of the day it was time for a new hit to take over champion duties, and Think Like A Man is a hit. Bringing in $33 Million, Think Like A Man ranks as one of the biggest openings of the year. The movie surpassed the expectations and becomes another victory notch in Sony’s belt on the year. When you compare Think Like A Man’s opening with other like films it is ahead of nearly all of them. The strong weekend also ranks as Screen Gem’s third number one opening of the year. Coming in at number two is the next in a seemingly endless line of romantic films hoping to rekindle The Notebook’s fervor. The Lucky One pulled in nearly $23 Million, which actually made more than Nicholas Sparks’ most famous adaptation. However, like another recent Sparks adaptation, Dear John, more money doesn’t translate to more popularity. If you can forgive us the headline long enough for us to tell you the news, we would appreciate it. The search for a director to take on the Hunger Games sequel Catching Fire after Gary Ross decided to walk away is over. The man Lionsgate has chosen to take up the torch and continue the blockbuster franchise is Francis Lawrence. Lawrence won the coveted gig after after other directors like Moneyball helmer Bennett Miller had to drop out due to a scheduling problem. According to the report, he was always a top pick for Lionsgate but his deal finalized when others such as Miller had to drop out of contention. Additionally, Lawrence can get started right away so the film can get into production before star Jennifer Lawrence (no relation) has to head back to the Marvel Universe and suit up for the sequel to X-Men: First Class. In case you can’t place the director’s name, his previous credits include Water For Elephants, I Am Legend and Constantine as well as music videos for Britney Spears, Jennifer Lopez and Green Day. So, he’s got some directing chops as we like at least two of his movies (no, not the one with RPat). So, with the sequel to Hunger Games now seemingly on track, look for it to arrive in theaters late in 2013. Kind of hard to not sound redundant at this point, but The Hunger Games once again beats off a flurry of new comers and takes the weekend. With a very solid hold from last weekend, the adaptation has now brought in over $337 Millions dollars. There is no reason the film wont play well over the next few weeks and the box office world braces itself for a huge summer. Unforgivably, The Three Stooges came in at second place with $17.a Million over the weekend. This actually represents the third highest opening for a Farrelly Brothers film which seems like encouragement for the future of these types of films. The general success of the film isn’t repulsive because of the film itself, but more so because it goes on record as beating whats at number 3. The spectacular The Cabin in the Woods debuted in the third slot this weekend with a hair under $15 Million. In context to what the film is, and how it was marketed, that is a pretty solid number. It just stings a bit that a film as effective and crowd pleasing as this isn’t going to have a bigger audience in the movie theater.